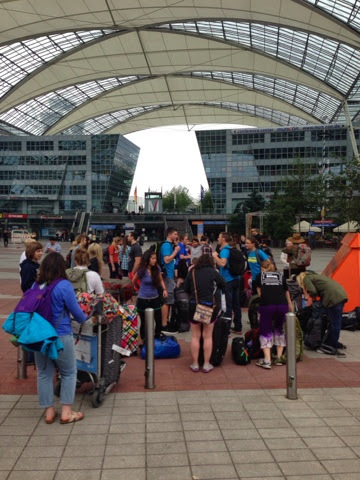 Every year when our summer interns arrive in Europe they step off the plane or out of the car to start the Amazing Race for the first three days of their internship. It is modelled on the Amazing Race TV show where teams do crazy challenges and receive clues that lead them to their next challenge. The year I led an intern team in Czech the Race was mainly in Poland and a little in Czech. Last year we raced in Ukraine. This year the Race was entirely in Slovenia. So, on Tuesday morning twenty-five people left Cesky Tesin for Slovenia – people from Czech, Poland, Estonia, Latvia and Ukraine had travelled to Cesky Tesin the night before and stayed at my flat and the Yormans’ house. On Tuesday night we had a leaders’ meeting that outlined the next three days. On Wednesday morning a couple of us got up really early to drive to Munich to pick up the interns and get them on the bus to Slovenia. Thankfully we don’t lose anyone… although that might have been a real fear at one point until we found out the bus actually had fifty-two seats, not fifty like we’d been told. I’ll pause here to say that I have now driven in Germany, Austria and Slovenia. And Austria is stunning to drive through – the Alps were filled with fog and there are lots of tunnels, including a 7km long one that connects Austria and Slovenia. 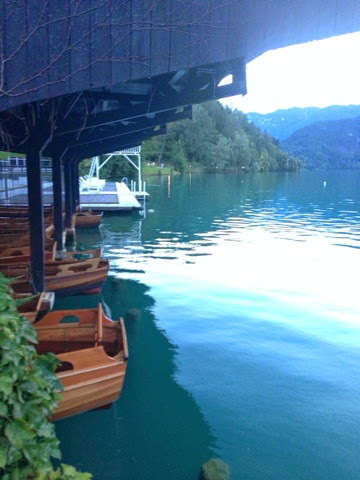 The race started at Lake Bled. Our nineteen teams started with a challenge that involved one person swimming to retrieve a key to open a lock. They then had to row, as a team, over to the island in Lake Bled where several other challenges awaited them. My station on that first day was to wait at the local train station for the teams and to ensure they all got on trains to Ljubljana, the capital of Slovenia. The first team showed up forty minutes before the train did and they were super excited to be the only team there. So of course two minutes before the train showed up a bus holding the other eighteen teams arrived. 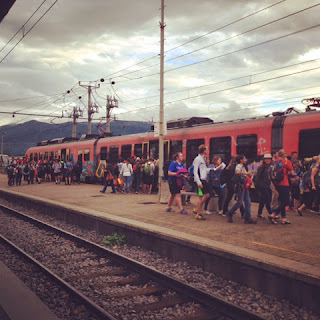 Watching nineteen teams, primarily composed of Americans, get on one tiny train at a quiet train station was quite the sight, and the locals laughed a lot. There were more challenges waiting for them that night in Ljubljana. One was learning the Slovene national anthem! 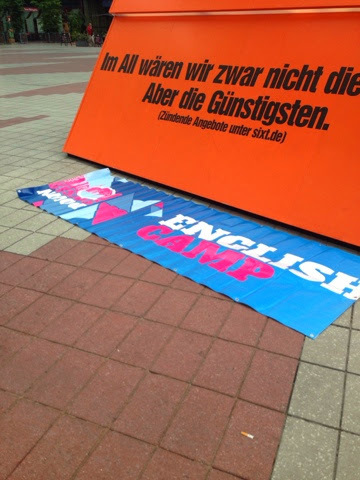 They had to find a local to teach it to them and then the team sang it on the main square. The next day we were in Ljubljana the whole day. It is a beautiful city. It doesn’t feel like a capital city at all and there are lots of cute little shops and many beautiful bicycles. My first station that day was at the castle, which is on the top of a hill in the city. Teams were given a little Lego model and the pieces necessary to make it. Only one person in the team could see the model and only they could speak. They had to describe it to the rest of their team. I did this challenge in Krakow and it is really good at making you think about communication. Other highlights from day two: there is a bridge in Ljubljana where people jump off into the river and one person from every team had to do that. 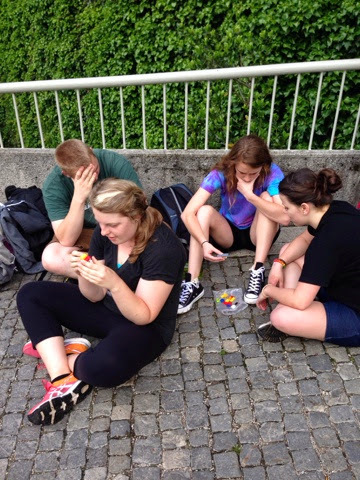 Teams had thirty minutes to find items that started with every letter of the Slovene alphabet.. in Slovene. This was a very fun station to be at! 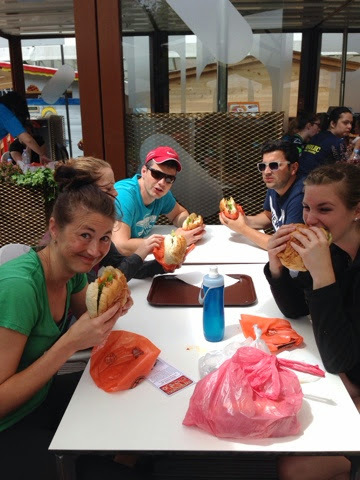 The teams also had to eat horseburger. The place is actually a really popular little place but the burgers were quite big and a lot of teams struggled here. There was some throw-up. I did try horseburger and, honestly, it doesn’t taste anything different from a hamburger. One of my favourites from this day was something that was set up to be a culture challenge – teams were sent to Slovene homes and were told to ask questions and learn about the culture. Every year there is a food challenge and, having eaten the horseburger, teams thought they were in the clear. But while they were in homes they were served the Czech speciality of tlačenka… It is horrible. But they were in homes so they had to be polite. I loved this challenge because this is what a summer, and life, in Europe involves – being in homes with people who don’t speak a lot of English and who serve you something that you have to eat, regardless of how you feel about it. On the last day we got up early to head to Maribor – the interns were on the train and some of us were driving. It was fun to be back in Maribor, where I’d been last December for a meeting. 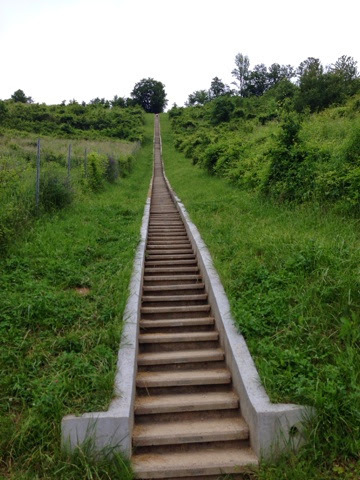 The only station I was responsible for that morning was at the top of a very large hill, called Calvary Hill. There were four hundred or so very steep stairs. It was funny when some of the interns arrived up there, rather frustrated at having climbed all those stairs, and I explained that we’d had to climb them too. Some intern teams received poor directions from locals – although the clue specifically directed them up the many stairs, a lot of locals sent them up the other side of the hill. This meant it took teams a while to find us and some climbed the mountain more than once. 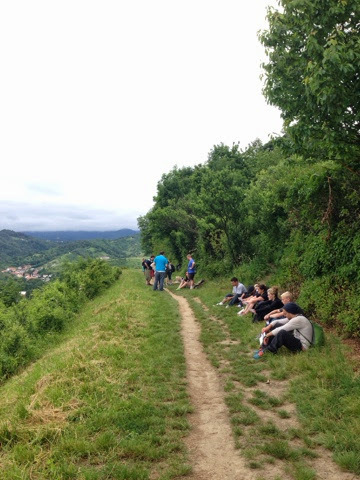 When they got to us they were very thankful to learn they had to spend ten minutes at the top of the hill and they were given a short devotion to reflect on where they get their energy from, and they were given the opportunity to have communion. The rest of the day for them involved learning a traditional Slovene dance, interviewing young people about what they think about God, identifying all fourteen of the JV countries and their languages. 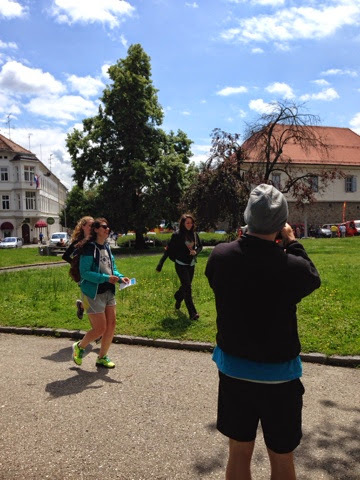 The first team to cross the finish line was Romania! The reason we do the Amazing Race is to give these multicultural teams an opportunity to meet and bond. There’s something about throwing up horseburger together or rowing across a lake that gives you a shared experience that really helps unite the teams. It also gives the teams, and especially their leaders, the chance to see the strengths and weaknesses of their teams. And there are also times of conflict on the team that give the teams the chance to work through things. Our interns did so well on the Amazing Race, it was a joy to serve them in it. 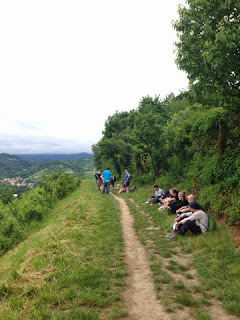 And from Maribor we all hopped into cars and a bus to head north to Czech, to Malenovice, to Intern Training!